CROSSING SIX CORNERS / BEST OF SIX CORNERS AWARDS ANNOUNCEMENTS. 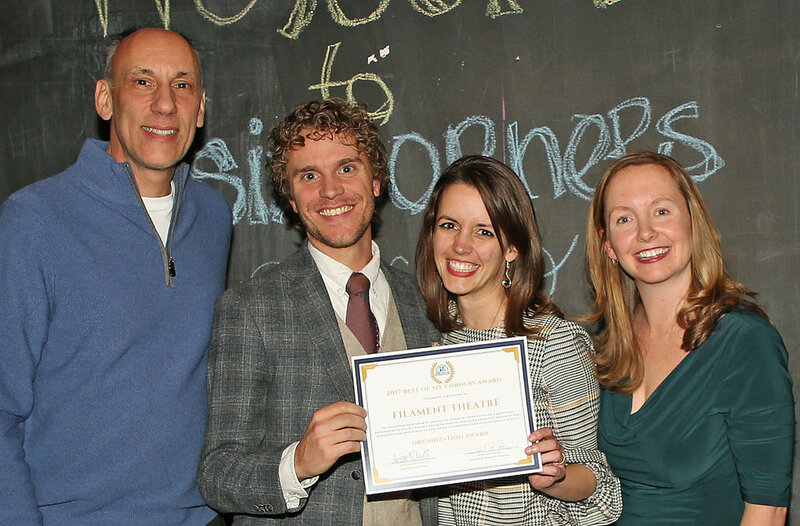 Six Corners Association hosted its first ever "Best of Six Corners Awards" on Friday, November 10th at Filament Theatre with an awards reception and premier performance of Crossing Six Corners. The Six Corners Association is a community economic development non-profit that strives to enhance our thriving northwest side commercial district through business assistance, beautification, neighborhood involvement and promotion. We follow the Main Street America approach to community revitalization that centers around Transformation Strategies which are articulated, focused, deliberate paths to strengthening a commercial district's economy. These strategies should be organized around the four points of Economic Vitality, Design, Promotion, and Organization. Six Corners Association recognized four businesses who were nominated by their peers for exhibiting excellence across these four points. These businesses, led by the leadership of their owners and managers, have shown remarkable dedication to and participation in the elevation, growth, and prosperity of the Six Corners community. Additionally, we recognized one individual who has been a stakeholder in the Six Corners community for 40+ years and a partner to our collective success through each endeavor we've undertaken. The 2017 Six Corners Design Award was presented to a business or property at Six Corners that exhibits excellence in facade design, visual merchandising, overall curb appeal, and/or a new and improved look. From his classic barber pole and gold leaf lettering to repurposed church pews in his waiting area, Jesse's Barber Shopexudes class at every corner. There is not a single detail left unconsidered. One of his nominators wrote that stepping into his shop is stepping into yesteryear and it represents the history, nostalgia, and prosperity Six Corners is widely known for. We were pleased to present this year's Design award to Jesse Barrera, owner of Jesse's Barbershop, located at 4851 W. Irving Park Rd. The 2017 Six Corners Promotion Award was presented to a business or property at Six Corners that exhibits excellence and imagination in promotion, marketing, special events, social media, and elevating the profile of the Six Corners Shopping District. This year's recipient has won over every skeptic who questioned the viability of a storefront filled with plywood and chainlink. But in the first few months since the doors opened, Ax Throwing as a sport and hobby has put Six Corners on the board with a whole new customer draw (especially birthday parties, bachelorette parties, etc. ), strong social media engagement, and further solidification and diversification of this commercial district as an entertainment district offering a completely unique experience found (almost) only at Six Corners. We were pleased to present this year's Promotion award to Scott Hollander, owner of Thunderbolt Chicago, located at 4842 W. Irving Park Rd. The 2017 Six Corners Economic Vitality Award was presented to a business or property at Six Corners that exhibits excellence in the redevelopment of the commercial district through a successful build out or remodel, new opening or reopening of a business, rehab of a building or exceptional dedication by a property owner. This year's award recipient really honors two parties for the effects and benefits of one project. For years, our Portage Park community has sat in rapt attention awaiting the redevelopment of the former Bank of America building at 4901 W. Irving Park Rd. Not only did the readaption of that space come to near completion this year under the leadership of Charles Cui, but his athletic, incredibly fit team has taken Six Corners by storm. Their enthusiasm for making their home at Six Corners is evident in their state of the art build out, energetic community outreach, and openness to partnering with the Association as well as all our fellow businesses to revitalize and activate a long dormant corner of Irving Park Rd. We were pleased to present this year's Economic Vitality award to Rey and Chris, from Retro Fitness - Irving Park, located at 4901 W. Irving Park Rd. The 2017 Six Corners Organization award was presented to a business or property at Six Corners that exhibits excellence in community character, has demonstrated a significant contribution to the Six Corners Shopping District, and goes above and beyond in their dedication and enthusiasm to helping better the neighborhood and commercial district. An important consideration in guiding the revitalization of a community is ensuring the involvement and encouragement of multiple generations for years to come and cultivating a place for all of our residents, new and long-term. As we take a look around the theater, we can attest to the home that's been created within their four walls. As a place for families to come play, it's also the the launching point of community gathering, of social activism, of learning and creative exploration that has become "THE place" for anyone looking for a home at Six Corners. We were pleased to present this year's Organization award to Christian and Julie, Directors of Filament Theatre, located right here at 4041 N. Milwaukee Ave. The 2017 Six Corners MVP award was presented to an individual who has exhibited exceptional dedication to the success, growth, and prosperity of the Six Corners Shopping District and has been a standout advocate and volunteer throughout the past year. In the case of this year's recipient, it's been the past 48 years. As the former owner of the Sears Key Shop, SSA Commissioner, and Director of the Association Board, he has demonstrated decades of volunteer hours to supporting the business community at Six Corners. This year, we literally couldn't have pulled off any of our special events without him. He built children's games, giant Jengas and washers as our resident carpenter, worked 24 hours straight running those games at BBQ Fest, sold concessions for Social after Six, directed cars at the Drive In Movie, gave tours on Open House Chicago, and picks up the phone anytime we call. He has been, undisputably, the most valuable person on the Six Corners team this year. We were pleased to present this year's MVP award to Dale Harris. Six Corners Association wants to recognize every business that has had their doors open at a Six Corners location for 20 years or longer. We are appreciative and proud of our business owners who have sustained their companies through the ebb and flow of the economic climate and shifts in retail markets and still perservere while maintaining their commitment to this shopping district. Irving Cicero Currency Exchange:20 years.